Wind several bobbins in the same color as your top thread. 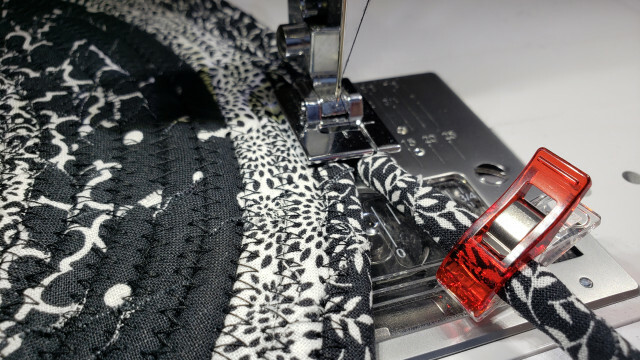 Thread the machine and set for a wide zigzag stitch. Stitch length 2-3. Unroll the jelly rolls and divide the colors by hue. Create four stacks Lightest, med-light, med-dark and darkest. Cut each jelly roll strip in half lengthwise before using so each strip is 1 ¼” wide. 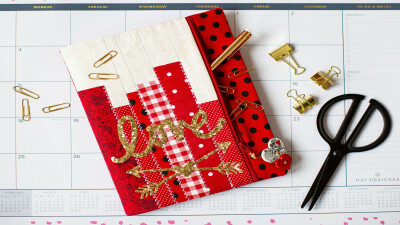 Note: This project is also a good way to use up scraps. You will need approximately 4 yards of fabric or 80+ strips of 1 ¼” wide fabric. Start by wrapping the end of the clothes line with a piece from the darkest stack. 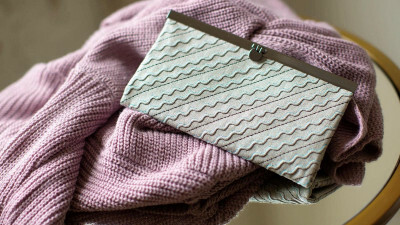 Use the wonder clips to hold the fabric to the cording until it is sewn in place. Measure down the wrapped cord 2 ½” and fold it over. Note: Making the folded first cord row longer makes the rug shape more of an oval than a circle. Zigzag over the cord connecting the two pieces of cord. Stitch over the end of the cord several times to secure it in place. Start to turn the wrapped cord into a circle stitching it to the previous row of cord. Continue wrapping the cord until you get to the end of the first dark strip. When you reach then end of the strip overlap a strip from the lightest hue. Using a double cording foot is helpful as the foot has a channel for each side of the cord to feed through. Align the cord to the next row keeping it as flat as possible. Do not pull the rows tight as this will make the rug start to curl. Note: I did not stitch all the strips together lengthwise as I found it easier with less tangles to wrap the cord with the strips shorter. Continue wrapping and stitching placing two strips of the same hue next to each other before switching to the next darker hue. As the rug builds an extension table or machine lowered into a cabinet is helpful to keep it as flat as possible. Remember do not pull the rows tight as this will make the rug start to curl. Continue wrapping the fabric clipping it down with the wonder clips and sewing the rows together. 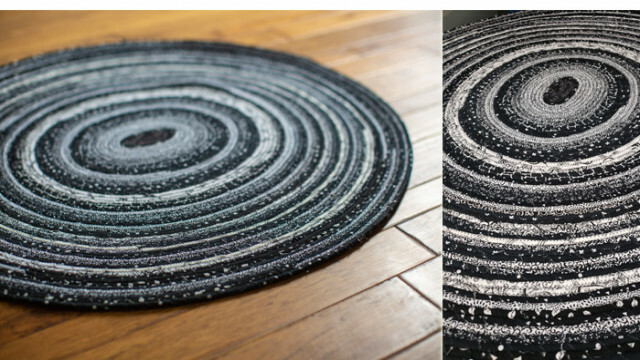 Transition the color hues from light to dark to create a galaxy spiral effect on the rug. When one section of cord runs out, use a small piece of masking tape to connect the next cord. Do not overlap the cord as this will make a noticeable lump in the row. The masking tape will stay in the rug and be covered by the fabric and can be stitched through easily. When the rug meets the desired size, wrap the fabric around the end of the cording. Trim off any remaining fabric and tuck the end in. Zigzag stitch the end close and tight to the previous row.